2 achetés = 1 OFFERT ! Mycelium Mushrooms Spores Spawn Dried Seeds/Boletus Aestivalis. Boletus Aestivalis. Mycelium Mushrooms Spores Spawn Dried Seeds. Spread the mycelium evenly over the entire surface. Mycelium grows for many years, while the tree lives. It is one of the earliest species of white mushrooms, it appears already in May, bears fruits in layers until October. Mycelium Mushrooms Spores Spawn Dried Seeds/Boletus Edulis. Mycelium Mushrooms Spores Spawn Dried Seeds. Spread the mycelium evenly over the entire surface. Mycelium grows for many years, while the tree lives. Every year, in the hot or cold season (when the mushrooms do not grow), sprinkle the humus at the rate of 15kg / m2 evenly on top of the mushrooming site. Model Number:Mushroom Seeds. Variety:Mushroom Seeds. We are sure that we will give you the best solution in every single trouble that you want us to resolve. Quantity: 50 PCS. Product Type:Bonsai. Classification:Mini Garden. 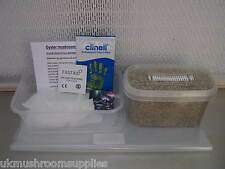 This space saving oyster mushroom grow kit contains everything needed but spores. Just choose the species you wish to grow, acquire spores and your ready to grow! Grow oyster mushrooms or. "any other" edible mushrooms of your choice as the sterilised substrate is not pre-inoculated. Einfach Pilze anbauen. Draußen und drinnen Pilze anbauen …. Sie beschreibt außerdem, welche Pilzarten auf welchen Substraten draußen und drinnen gedeihen und wie günstige Bedingungen für ein üppiges Wachstum geschaffen werden können. Chinese Black Oyster Mushrooms Seeds/Spawn Pleurotus Mycelium. Chinese Black Oyster Mushrooms Seeds/Spawn. A natural strain of oyster mushroom. Fruiting occurs in a wide temperature range from 8 to 24 ° C. Brushes are dense, large. Leg short, lateral, loose. Hats are dense, fleshy with very good external and taste qualities, well tolerate transportation. Growing on alder, cottonwood, poplar, oak, birch, beech, aspen and many other hardwoods, our aggressive strain is renowned for its productivity. You simply drill holes into a fresh cut hardwood log and tap the plugs into the holes. And a few more coming. - Pes havaiian. Shiitake 3776 Imperial mushroom seeds spore. A delicious, edible mushroom, which can (and should) be eaten raw or sour cream with salt, in the form of a salad. The color of the cap is brown, brightens when ripe. Shiitake "outdoor cold" - Lentinula edodes mushroom Plug Spawn -75 dowels/Growing Plugs. Shiitake mushrooms are one of the easiest and most prolific, forgiving mushrooms to grow on logs for all skill levels, and a perfect mushroom for beginners. You simply drill holes into a fresh cut hardwood log and tap the plugs into the holes. Log will be fruiting in 6-9 months, depending on amount of plugs used. Logs will produce for 3-4 years. You can use soft woods as well, but production will be a bit less but will fruit faster on softer woods. Glow in the dark complete mushroom grow kit, no log needed! Spores included ! Lion's Mane mushroom -20 gr of mushroom spores integrated to grain. Mycelium of mushrooms Truffle Black Seeds Spawn - Free Worldwide Delivery . Mycelium of mushrooms Truffle Black Seeds Spawn. White and black truffles, grown from mycelium, are also adapted to traditional garden trees and shrubs. Mycelium is brought under the roots of already growing trees and shrubs or during the planting of seedlings. This oyster strain is the most “wide range” of all our Oyster strains. You will receive Two syringe full of liquid culture and a needles. 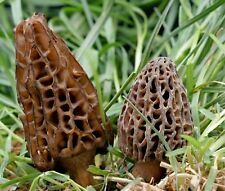 Great warm Climate mushroom. good mushroom for beginners. Two 10 cc of liquid clean culture for spawning mushrooms mycelium and colonization. CHIODI DI MICELIO DI PIOPPINO. 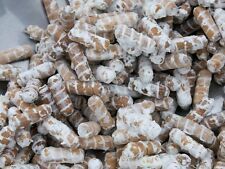 White Oyster Mushrooms Seeds/Spawn Pleurotus Mycelium. Unlimited expiry date on these seeds. The flesh is thin, elastic, white. Leg lateral 1-2 cm long and about 1.5 cm thick, cylindrical, continuous, white, felt-friable. It grows very well, like any kind of veshenok. 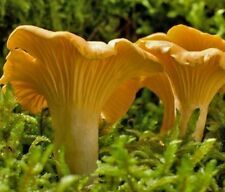 A luminous citrine yellow mushroom with a tangy flavor perfect in small quantities as an edible garnish. This mushroom lightens in color when sautéed to provide a fungal feast for both palate and eye. Mycelium Mushrooms Spores Spawn Dried Seeds/Cordyceps. Coming into motion, he throws out his spores, which are glued to the body of the caterpillar with the help of suckers. Soon, spores are embedded in living tissue. The caterpillar does not feel any signs of infection until it wants to bury itself in the ground in the winter in the hope of becoming a pupa by spring. There are three varieties of bipolar mushroom: white, cream and brown. The surface of the cap is smooth, in the middle often glossy or radial-fibrous, can be scaly. The flesh is dense, juicy, on the break pink or blushing. Mycelium Mushrooms Spores Spawn Dried Seeds Oyster/Pleurotus dryinus. Mycelium Mushrooms Spores Spawn. Press well and mix thoroughly with the mycelium (1up per 15kg uvl. Substrate). The period of overgrowth of mycelium 3-6 months. at t 7 27. Oyster mushrooms are edible mushrooms, often referred to as oyster mushrooms for their similarity in taste with these seafood delicacies. Reishi Dry mushroom spawn seeds Ganoderma lucidum - Free Worldwide Delivery . 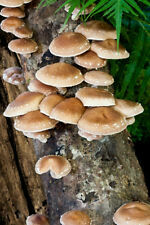 Reishi mushrooms contain only 75% water, while many other fungi are 90% water. Reishi mushroom has a general toning and immunomodulating effect. It is associated with the polysaccharide - p-D-glucan (ganoderan), and chitin, which affect the phagocytes and T-lymphocytes, to normalize the level of antibodies in vitro. Red Reishi (Ganoderma resinaceum)-mus hroom liquid culture 10cc syringe. Also if the liquid inoculant is a clone (generated from sectored agar or mushroom tissue), then each jar should show similar growth speeds and maturity. Mushroom Seeds Spores Spawn Agaricus velutipes Mycelium. Wood is used as a cut tree in the form of hemp and on the root. Cuts or holes are filled with mycelium. Or split a piece along, pour a thin layer of mycelium, fold the halves and tighten the wire tightly. Champignon mushrooms Royal seeds spore. Champignon royal differs from the usual, above all, the color of the cap - in adult mushrooms it is colored brown. Such mushrooms have a more pronounced mushroom taste and odor. Oyster mushrooms (grey) seeds spore. During the period of germination (3-4 weeks), light is not necessary. Silver Coins. In the bar drill or file holes, make a mycelium (1un for 15 kg), glue the holes with adhesive tape or lay with straw, or plug up with a cotton / cotton swab, or cover the other way. Coral Tooth Fungus Mushroom Seeds Spawn (Hericium coralloides) Mycelium. 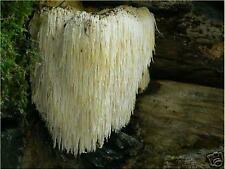 Hericium coralloides Mycelium. It is good to wring out and mix thoroughly with the mycelium (1yr to 15kg of substrate). In the bar drill or file holes, make a mycelium (Iyen on 15kg), glue the holes with adhesive tape or lay with straw, or plug it with a cotton / swab, or cover it in another way. Oyster mushrooms pink seeds spore. In the bar drill or file holes, make a mycelium (1un for 15 kg), glue the holes with adhesive tape or lay with straw, or plug up with a cotton / cotton swab, or cover the other way.